Where is our Research Going? 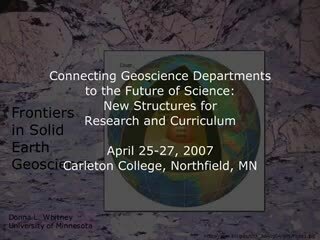 Strong Geoscience Departments > Connect to the Future of Geoscience > Where is our Research Going? 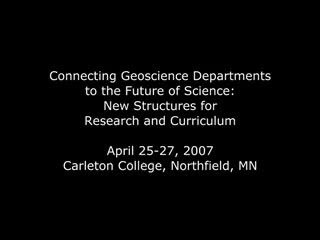 One focus of our 2007 workshop on Connecting Geoscience Departments to the Future of Science: New Structures for Research and Curriculum was the question of where geoscience research is headed. Each of the following presentations addressed that question. Simon's presentation focuses on opportunities emerging from our improved understanding of systems and processes, from improved analytical capabilities, and from the growth of interdisciplinary collaborations. Length of video: 15 minutes, 11 seconds. This is a 13 minute video. John's presentation focuses on two major trends in environmental geology and hydrogeology: multidisciplinarity and predicting the behavior of Earth systems. View this video of John's presentation by clicking on it. Alternatively, you can download the video in quicktime (Quicktime Video 144.2MB Jul13 07) format or download an outline (Microsoft Word 29kB Apr30 07) of John's talk. Length of video: 13 minutes, 20 seconds. Donna's presentation focuses on integrating our understanding of processes from different spheres of the Earth; in particular, making connections between deep processes and surface processes. Length of video: 12 minutes, 46 seconds. 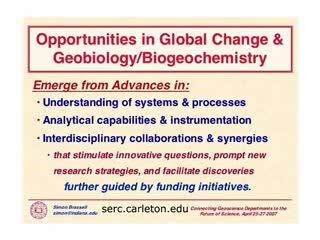 Simon Brassell speaks about Opportunities in Global Change and Geobiology/Biogeochemistry. John Fountain speaks about Future Research Trends in Environmental Geology and Hydrogeology. Donna Whitney speaks about Frontiers Solid Earth Geoscience.